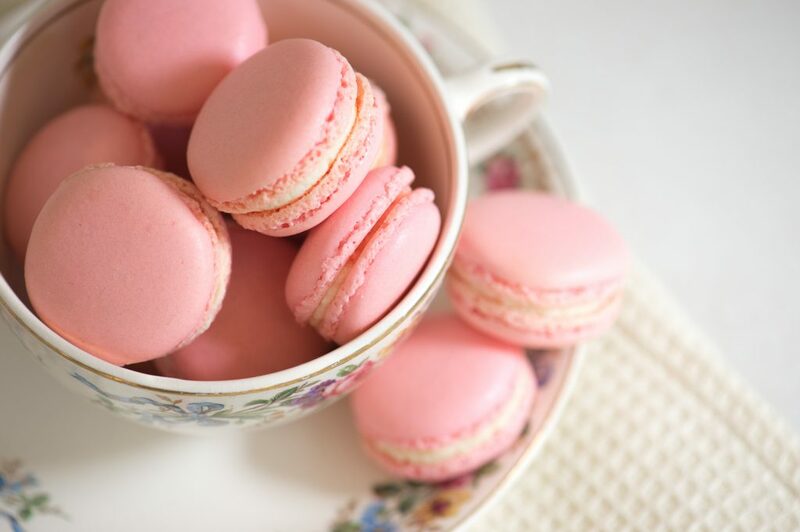 I recently hosted a baby shower for a friend, so naturally pink macarons were in order! When it came to planning the flavour, I immediately thought of Raspberry and White Chocolate – one of my favourite combinations. Macarons being the tricky little guys that they are, it’s best not add any fruit purée, so I used a concentrated raspberry flavour (available at baking stores). I love using creamy ganache as a filling for macarons but this time I decided to whip the ganache. The resulting texture is divine – it’s light and fluffy, almost like a buttercream but less sweet. Combine the sugar and water together in a small saucepan over low heat. Heat gently until the sugar has dissolved, then increase the heat. With the mixer running on medium speed, carefully pour the hot syrup in a thin stream down the sides of the bowl, away from the whisk. If you are using a hand-held mixer you will need an assistant to do the pouring here. Continue mixing until the bowl feels cool to the touch. Sift together the icing sugar and almond flour through a fine sieve. Make sure to push all the almonds through the sieve. Stir together well, then add the egg whites (B) and mix well with a metal spoon to make a thick paste. Mix in the raspberry flavour and food colouring (remember the egg whites added now will dilute the colour, so add a bit more than you think you need). To make the ganache, add all ingredients to a heatproof bowl and place on top of a pan of simmering water. Stir until the chocolate is completely melted and the mixture is smooth. Allow the mixture to cool at room temperature until set. If it’s a warm day, you can speed this up by placing in the fridge for about 30 minutes. Once the ganache has cooled and set, use an electric mixer to whip the ganache. It may seem too hard at first, but soon starts to become light and fluffy. Once you achieve a buttercream-like texture (around 2 minutes), stop whisking. After the ganache has been whisked, it’s best to pipe it fairly soon as it becomes too hard to pipe if refrigerated. Place the ganache into a piping bag fitted with a plain round nozzle. To assemble, match like sized macarons together, then pipe a generous amount of whipped ganache onto one macaron, and sandwich gently with the other macaron. 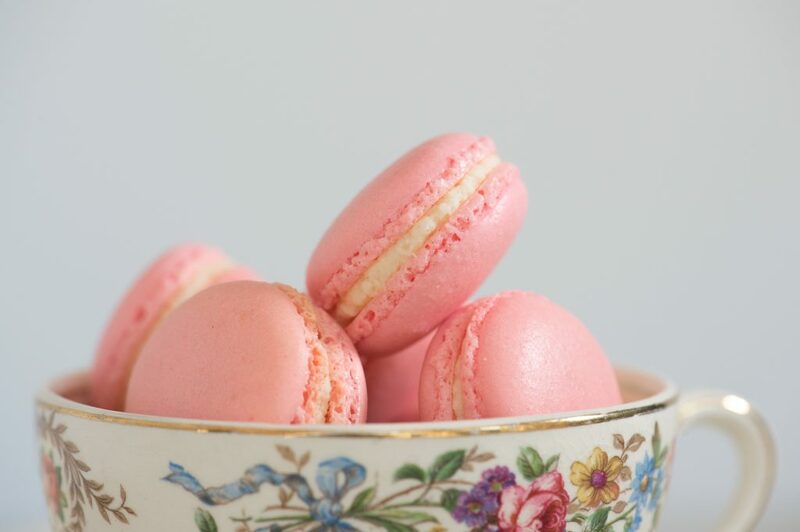 Place the assembled macarons into an airtight container and keep refrigerated until ready to serve, or up to 3 days. The macarons actually taste better after “maturing” in the fridge overnight. Personally I prefer to leave them at room temperature for 30 minutes before serving, so they aren’t cold and the ganache is not too hard. I’ve read through the recipe a few times and I’m a bit stuck. Feel like I need to take home economics again!! The 2nd and 3rd bullets under directions mention blueberry compote, lemon juice and corn flour. 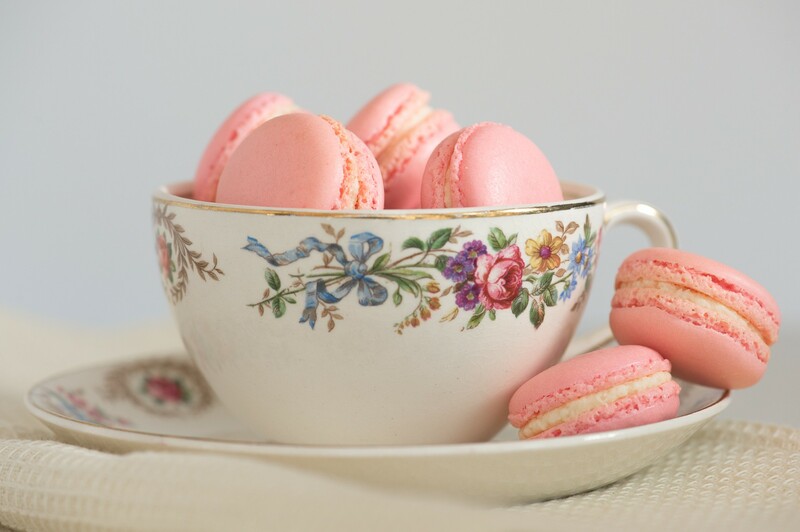 Is this still for the raspberry macarons or is it for a blue macaron (in case baby shower baby is a boy) recipe? Hi Lauren! Well spotted- that was an error on my part and has now been removed. Apologies for the confusion!